During the San Fermin fiestas, rural sports enthusiasts can enjoy watching the different exhibitions and contests organised each morning in the Plaza de los Fueros square. The show starts at midday with demonstrations by famous sportsmen in the various categories, such as stone lifting, tree trunk cutting and tug of war. Spectators can also enjoy sampling artisan-made local produce. This is an ideal opportunity to discover some of the oldest sports in the region, disciplines which bring to mind the life and traditions of rural Navarre. Rural sports have always counted on enthusiasts who come to watch the aizkolaris amd arrijasotzailes. The aizkolaris imitate the hard work of the wood-cutters, fighting to be first to finish the cut, with precision and a great deal of effort, filling the air with splinters of wood. The exhibition of the strength of the arrijasotzailes or stone lifters is evocative of the hard task of transporting the stones from the quarries. The rural sports exhibitions and contests are an intrinsic part of the San Fermin program. Years ago, these were held in the bullring, until the organisers finally decided to move the contests to the present location, being a more logical stage for exhibition sports, given the fact that in the villages and towns they are held in the open-air in the main square or jai alai court. Famous stone-lifters such as Natxo Saralegi and Iñaki Perurena have taken part in these exhibitions. 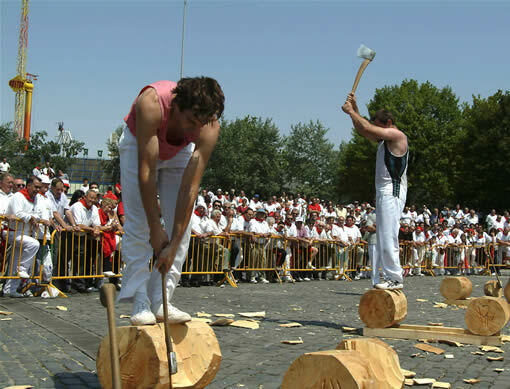 The San Fermin program includes the following events: Navarre championship for Tronzalaris (cutting logs with a two-man saw); bale lifting; stone lifting and anvil lifting; in addition to the stone lifting contest in pairs and Txing erute (a race with a 50 kg weight in each hand). Exhibitions of tug of war, Tronzalaris, Stone lifting, wood preparation, trunk cutting with an axe, running, corn cob picking and bale throwing. 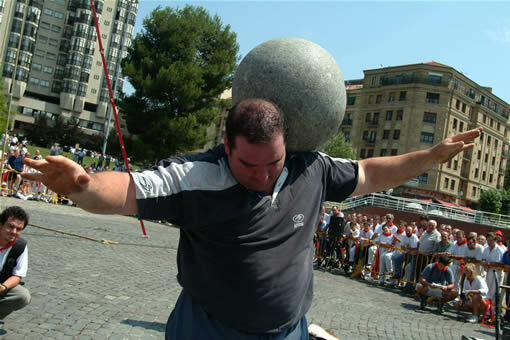 The San Fermin Award for young Aizkolaris or stone-lifting is also held, with a combined Herri Kirolak (Basque rural sports) for children, the San Fermin power saw contest, the Navarre Txinga erute championship and cart lifting. Jai Alai is another important Basque sports event during the San Fermin fiestas. The Labrit court, located in the Old Part of the city, fills to overflowing with jai alai enthusiasts anxious to witness the contests between the players. The tension is increased by the customary bets made by spectators. The most important tournament is the San Fermin Trophy, one of the most prestigious hand-ball tournaments in Spain. The San Fermin Tournament, within the four and a half category, is contested from the 17th June onwards and counts on the presence of the best Pelotaris (jai alai players) in Spain. The town of Huarte, very close to Pamplona, is the scene of another San Fermin Trophy - Basque ball with a pointed basket, contested at the Euskal Jai court. This is a highly prestigious annual contest for this sport. The bets placed by the Aficionados (enthusiasts) have always been customary during the sporting events held during the San Fermin fiestas. During the fifties, the bets placed in the bullring were famous. For the record, there were exiting challenges of the time such as the one made by Txikito de Arruiz from Navarre and Patxi Irizar from Guipuzcoa, who was sub-champion of Spain in cross country running in 1954 and 1955 and won the Cross of Guipúzcoa championship five times and the Cross of Elgoibar three times.